Located near the Avenue of the Giants in northern California, there was once a short nature walk that took visitors through the story of J.R.R. Tolkien’s The Hobbit via crude cement tableaus of key scenes and characters, but today all that remains of the attraction are a sparse bit of faded ruins. Erected sometime in the mid-1970s, Hobbiton USA was attempted to grab onto the then ascendant popularity of Tolkien’s fantasy novels. Their half-mile nature walk led visitors through the story of Bilbo Baggins, illustrating such scenes as Gandalf arriving to enlist Bilbo’s help, Bilbo’s encounter with the spiders of Mirkwood, and the climactic battle with the dragon Smaug. Far from the litigious scrutiny that would have been brought down on the attraction today, the scenes presented the characters in lovingly ball-parked cement sculptures that left characters such as Gollum and Aragorn almost unrecognizable. However each little diorama had a voicebox that would narrate the details of the scene with the push of a button. While a number of attractions in this section of the Redwoods still attract passing visitors, Hobbiton, USA seems to have closed down some time around 2009. 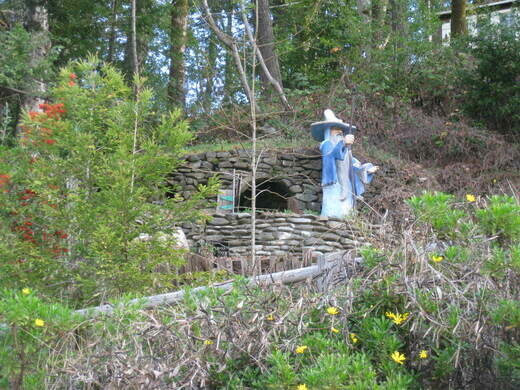 However according to reports, Gandalf can still be seen standing out front of Bilbo’s round hobbit hole door in the first diorama, overgrown and fading, but still holding a bit of homegrown magic.